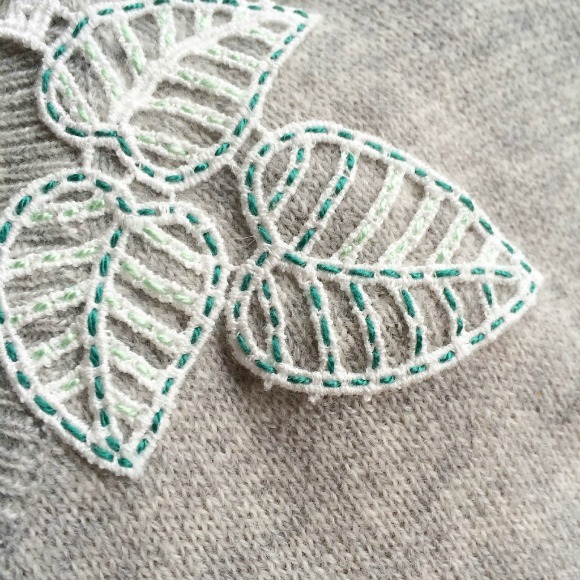 Today I would like to share this embroidery project that I have realized last Spring for my friend and customer Eri Takenaga. 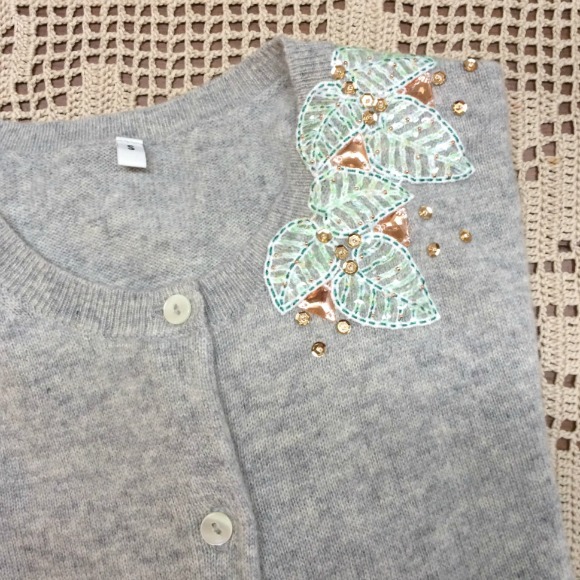 Eri-san had inquired earlier on if I could embellish a cardigan that she had bought at Uniqlo. I had not done anything like this before but I was really excited to come up with something pretty. 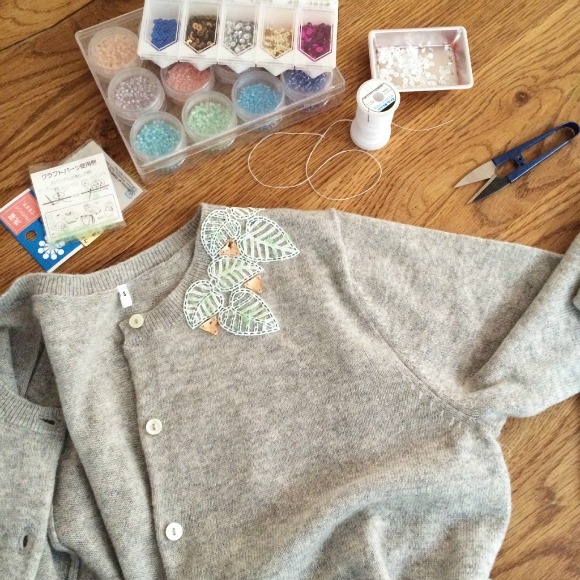 We agreed on a color scheme, and I was given the freedom to create te embroidery I wanted. I found the pretty leaf lace at the Lace Center in Harajuku, one of my favorite places in Tokyo to source unique lace materials. I put the lace on top of the cardigan and found the best way to display it. Then I used two different colors of DMC coton perlé (#955 and #991) and a running stitch to embroider the lace. Once the lace was fixed on top of the cardigan, the challenging part was to decide which other materials (bijoux, sequins, beads...) to use. 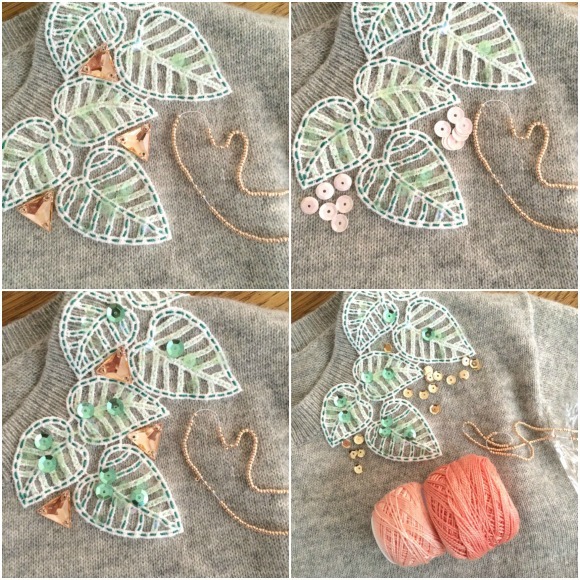 I had selected peach triangle-shaped bijoux, rose gold beads, transparent 4 mm mint green sequins, 5mm gold sequins, 6mm light pink sequins and 6mm green sequins. 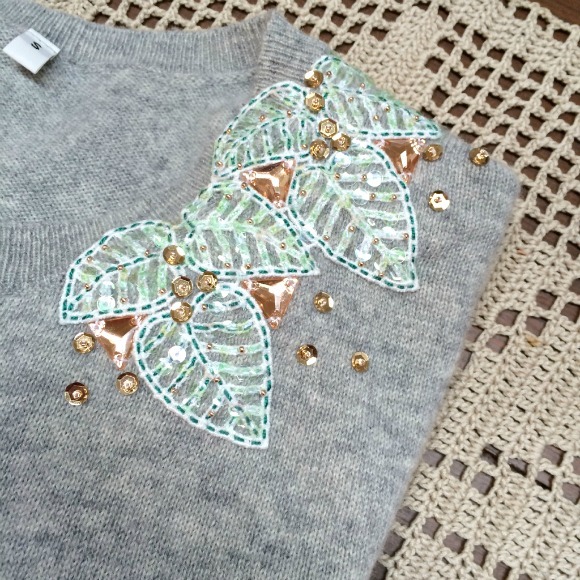 I quickly realized that the 6mm sequins were too big and the colors a little bit too strong. I finally opted for the bijoux, the 5mm gold sequins paired with the tiny rose gold beads and the 4mm transparent mint green sequins. 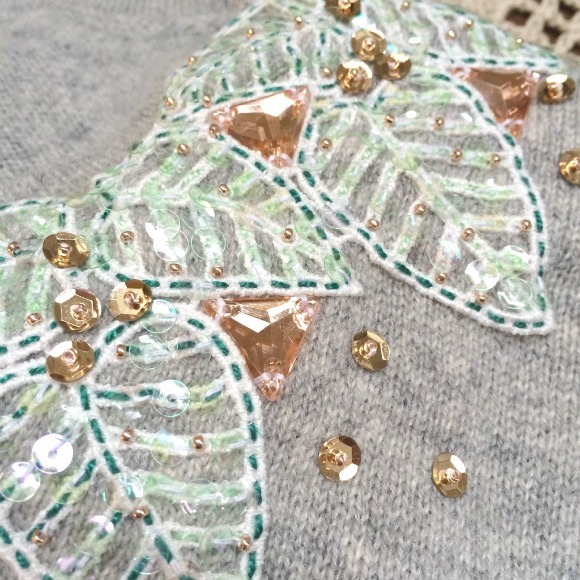 I sew the bijoux first then the mint green sequins on top of the leaves. 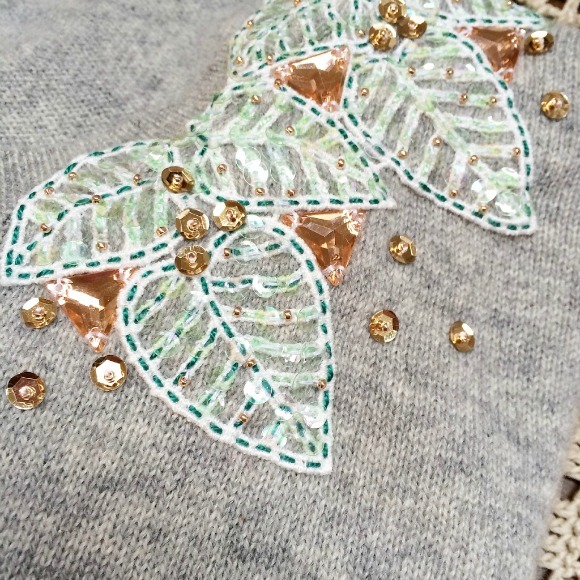 Lastly I randomly added the gold sequins held with 2mm rose gold beads around and in-between the lace, before finally sewing a few beads on top of the leaves. 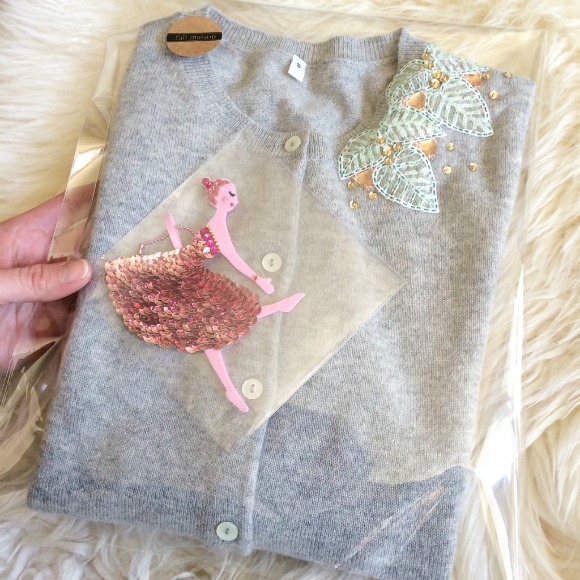 Voilà, the finished piece ready to be delivered to Eri-san together with a cute embroidered ballerina on a keychain!